Engineered by FUSO with passion and precision just like your truck, to give you the best in quality & reliability. This means you can rely on increased longevity, availability, as well as enhancing the resale value of your vehicle. By choosing Fuso Genuine Parts you will benefit from maximum performance and safety at all times. The availability of the required genuine parts determines the downtime of your vehicle. Turn to your Mitsubishi Fuso dealer for quick supply of the genuine parts needed to keep your truck running. Air Filters play a key role of providing clean and sufficient quantities of air to the combustion chamber of the engine by removing harmful impurities such as sand, metal particles, dirt and dust. Fuel Filters clean unfiltered fuel before it enters the fuel supply system by trapping impurities such as paint chips, dirt and rust particles caused by moisture in the fuel tank. 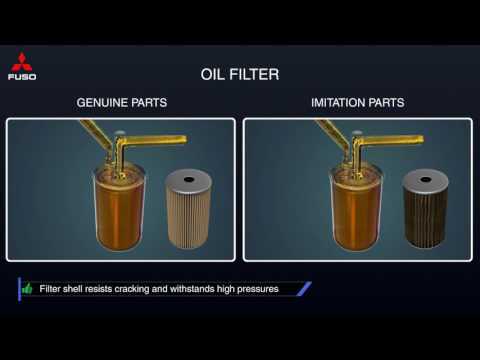 Oil Filters trap impurities from engine oil to prevent deterioration of the oil in order to maintain smooth engine operation. Brake pads are a crucial part of the braking system and therefore extensively tested for temperature resistance, performance and consistency. 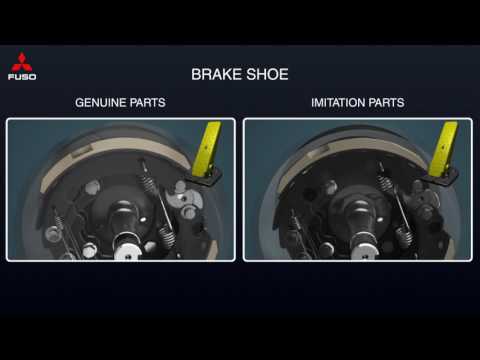 Brake Shoes are essential for the overall braking performance, safety and temperature resistence of your vehicle. 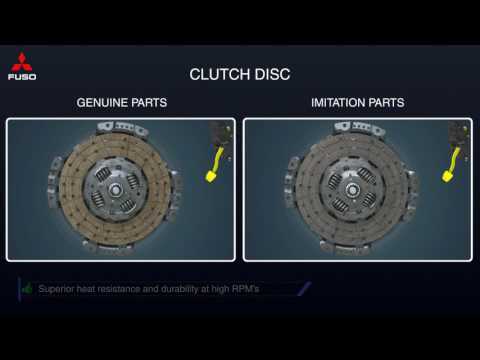 Clutch Disks play an important role of transmitting or cutting off power from the engine to the transmission when your vehicle is starting, accelerating, decelerating, or stopped. Pressure Plates ensure efficient operation of the clutch pedal to enable smooth gear shifts as well as provide a quiet and stable driving experience without vibration. 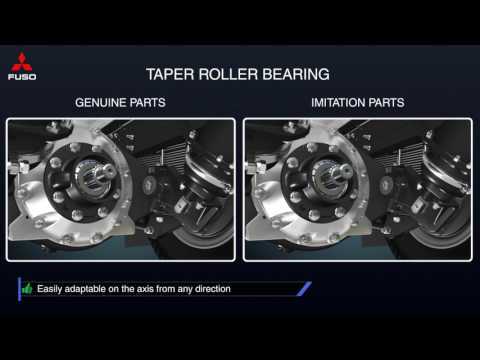 Taper Roller Bearings enable you to drive safely with high reliability and stable performance. Leaf Springs provide high comfort, high durability, and reduce vibrations while driving even at high speeds. Bushing Torque Rods serve important functions by controlling driveline angles of the vehicle while accelerating and braking in order to ensure low engine vibrations for maximum driving comfort. Fan Belts have high power transmission capacity assuring a smooth and quiet driving experience. 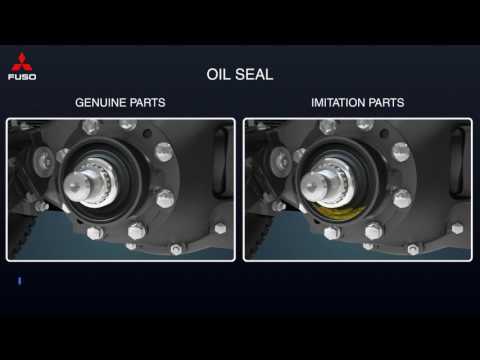 Oil Seals prevent lubricants leak and harmful contaminants from entering mechanical equipment for reliable performace. Take a look at the Fuso Genuine Parts and Accessories brochure for the parts’ descriptions and advantages on your vehicle. 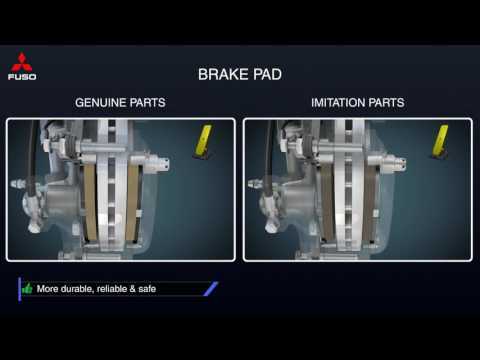 FUSO Genuine Brake Pads are a crucial part of the braking system. By coming into contact with the brake disk rotor, brake pads convert the vehicle's kinetic energy into heat energy to slow or stop the vehicle. Extensively tested for temperature resistance, performance consistency, noise, and durability, they ensure balanced, smooth and safe braking. 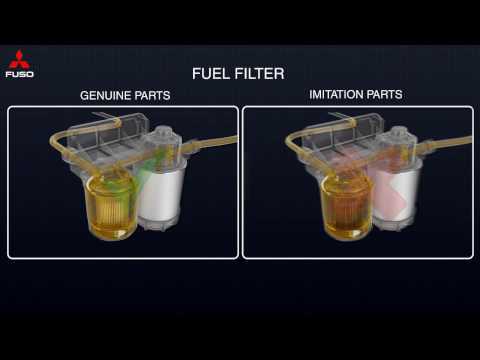 FUSO Genuine Fuel Filters clean unfiltered fuel before it enters the fuel supply system. The efficient removal of these impurities will prevent rapid wear and damage of the fuel pump and injectors. They are more resistant to leaks as they are made with heat-hardened glue, a higher standard compared to imitations. 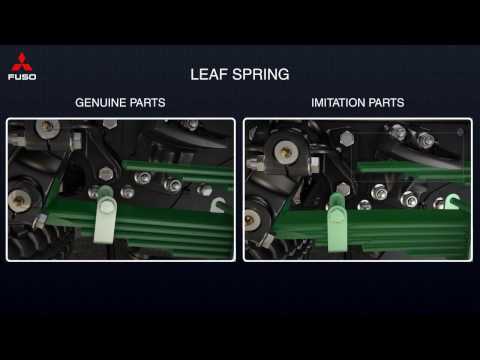 Although imitation parts may have lower initial price, they are more expensive in the long run due to their low durability and shorter maintenance cycle. FUSO Genuine Oil Filters trap impurities from the engine oil to prevent oil deterioration and maintain smooth engine operation. With its larger filtration areas, FUSO Genuine Oil Filters offer superior filtration, resist clogging, and trap impurities without restricting the oil flow. 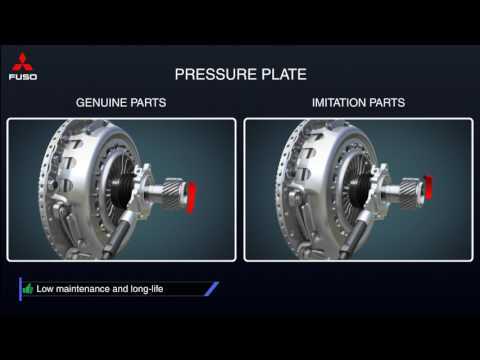 FUSO Genuine Pressure Plates have an important role to apply pressure to the clutch disc transferring torque to the transmission. Therefore it is neccessary to have regular maintenances for maximum performance and safety at all times. Extensively tested for stable performance, FUSO Genuine Leaf Springs offers you the maximum safely and reliability especially when driving long distances. Although imitation parts may have lower initial price, they are more expensive in the long run due to their lower durability and the shorter maintenance cycle. FUSO Genuine Taper Roller Bearings have passed FUSO's extremely demanding tests to ensure a high level of quality, performance consistency and durability in various situations. FUSO Genuine Brake Shoes are extensively tested for temperature resistance, performance consistency, and durability. They ensure balanced, smooth and safe braking you can always rely on. They are available for all FUSO vehicles because Genuine Brake Shoes have been developed to fit FUSO truck and bus models. 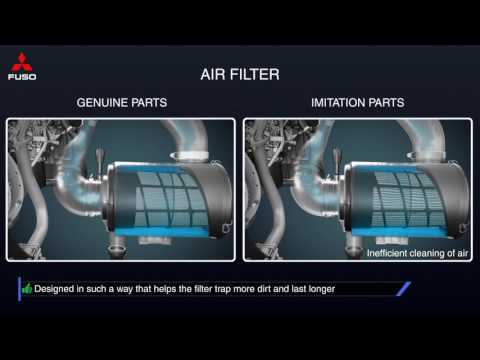 FUSO Genuine Air Filters are made with heat-hardened glue and are built very leak resistant. Their filter gaskets are precision-made from hight grade oil-proof rubber which helps maintain their elasticity for a secure seal. Imitation filters are less resistant to leaks as they use a weaker air-dried epoxy, and their gaskets are made from general-purpose rubber. If harmful impurities is mixed into the engine oil, it will hasten oil and wear area deterioration. Extensively tested for effectiveness and durability, Genuine Air Filters help to extend the life of engines as well as improve fuel economy. FUSO Genuine Oil Seals have important functions to stop harmful contaminants such as dust and dirt from entering a specific area and prevent lubricant escape. Therefore it is neccessary to have regular maintenance for maximum performance and safety at all times. FUSO Genuine Clutch Disks play an important role of transmitting power from the engine to the transmission as well as the ability to cut engine power quickly to prevent serious damage to the drive train. Designed for optimum performace and to provide stable transmission, they assure smooth driving comfort. 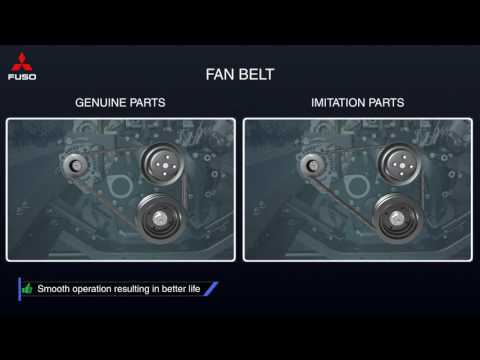 FUSO Genuine Fan Belts have high power transmission capacity assuring a smooth and quiet driving experience. They stay consistently effective because changes in speed have little influence on their performance. 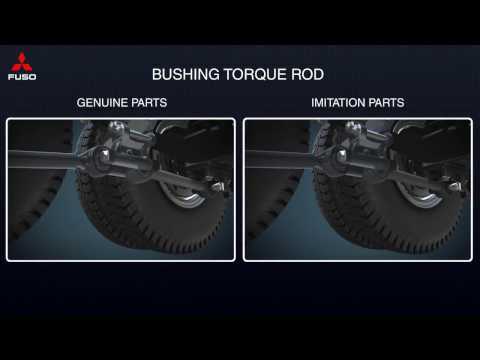 FUSO Genuine Bushing Torque Rods are very important components for reduction of engine vibrations while driving. While breaking or accelerating, they help preventing the axle's housing from twisting. They provide smooth movement and noise reduction with maximum durability for the long term.